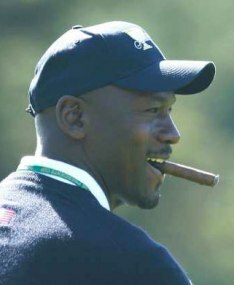 1) Michael Jordan drew the ire of San Francisco bureaucrats on Tuesday when photos emerged of him smoking a cigar. The former Chicago Bulls star, who is an honorary assistant for the U.S. at the Presidents Cup, was playing a practice round at Harding Park Golf Course. City officials subsequently asked the PGA Tour to remind Jordan of their ban on smoking on public courses. 3) Inside the Industry: Tatuaje has released “Drac”—a $13 torpedo (6.75 x 52)—as part of its annual Halloween release. According to reports, the FDA is sending agents into cigar shops to explore the possible regulation of flavored cigars. The four sizes of the Davidoff Cubano Claro limited release are set to hit stores soon. 4) Around the Blogs: Stogie Review checks out the new Illusione Nototros. Keepers of the Flame smokes a Cuchillos Cubanos. Cigar Inspector fires up a Cruzado. Cigar Spy tourches up a Room 101. Tampa Cigar Examiner examines the Don José Correa. 5) Deal of the Week: We can’t emphasize enough what a bargain these deals are from Cuban Crafters: a box of 25 La Carolinas for just $59 and a box of 25 Cupido Criollos for just $55. Both blends have received 4.5 ratings, which is amazing considering you can get them for under $2.50 a stick. Get yours here. Just to clarify, it is the Colorado Claro wrapper on four formats, Special T, Special R, Short Perfecto, and the Double R (which is not yet available). Exclusive distribution on this short limited production, highly sought after offering.